The new project from Obsidian Entertainment is without a surprise a RPG. 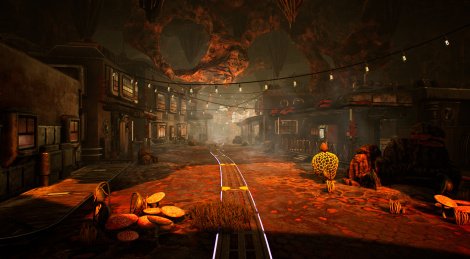 Published by Take Two's new label Private Division, The Outer Worlds is set to release in 2019 for PC and consoles. With a development spearheaded by Tim Cain and Leonard Boyarsky, the creators of Fallout, the game takes place on the edge of the galaxy where the main character is in the middle of a conspiracy that could make the corporate colony collapse. First details and screens inside, and maybe the trailer in good quality at a later time. In a corporate colony spiraling towards collapse at the furthest reaches of the galaxy, you are the unplanned variable. What path will you choose? NEW YORK--(BUSINESS WIRE)--Private Division and Obsidian Entertainment today announced The Outer Worlds. Co-game directors Tim Cain and Leonard Boyarsky, original creators of Fallout, have reunited for this new single-player RPG from the renowned team at Obsidian, developers of Fallout: New Vegas, Star Wars: Knights of the Old Republic II, South Park: The Stick of Truth, and the Pillars of Eternity franchise. The Outer Worlds will be available in calendar 2019, during Take-Two’s fiscal year 2020 (ending March 31, 2020) on PC, PlayStation®4 system, and across the Xbox One family of devices, including Xbox One X. The Outer Worlds will be available in calendar 2019, during Take-Two’s fiscal year 2020 (ending March 31, 2020) for PS4™ system, Xbox One, and PC. The Outer Worlds is not yet rated by the ESRB. For more information on The Outer Worlds, subscribe on YouTube, follow on Twitter, become a fan on Facebook, and visit www.TheOuterWorlds.com. Loved everything I saw of this game, the art style, humor and the little bit of gameplay shown. This is definitely a spiritual successor to Fallout, which is great since Bethesda probably killed the franchise unfortunately. With The Outer Worlds, Rage 2 and Far Cry: New Dawn, post-apocalyptic FPS games are thriving atm. Gearbox better make a great Borderlands 3, because the competition won't make it easy for them like when Borderlands 2 launched. Looks far more interesting than The new Rage and Far Cry games. It has known vibes but it's way less generic than the other stuff. Also, spacey stuff look less boring than post apoc in general. This has me hyped to the nth degree!! Obsidian's been pumping out great games lately, I'm in for this. tmw Obsidian shows Bethesda how to make a real Fallout game, and not only a Fallout game, but a Fallout game IN SPAAAAAAAACE. This came at the perfect time seeing as fallout 76 is garbage and everyone just wanted it to be single player. If it's a huge success it's going to be interesting to see how Take Two Interactive handle it moving forward. They likely will own the IP like in most publishing deals and obsidian is now MS owned so they're out of the picture. Will they just give it to another developer to continue? Maybe MS will buy the IP off Take Two? Crazy to think that obsidians first potential success in years could be snatched away immediately. I feel like this game is revenge on Bethesda for the crap they pulled in denying Obsidian their bonus on New Vegas. With proper funding, I hope they will put Bethesda in their place and make a better game than they could even imagine. Exactly what i thought. Heard there were some issues during New Vegas development.